I am a sinner. Quite easily, I fall into the sin of fornication and greatly enjoy it. I feel as though it is the most pleasurable feeling ever. I met a holy hieromonk who encouraged me to repent and confess my sins. Initially, I thought the meeting was a coincidence, but now, I realize it was by the grace of God. “Hmm,” I thought, “this priest seems friendly and kind. Why not? I’ll just go and chat with him as long as he keeps his promise not to deprive me from my greatest pleasure.” I found myself going to see him every week at church, albeit somewhat reluctantly. Without fail, these visits continued weekly without my realizing what was going on. After every visit, it seemed harder for me to fall into this sin, even though I was entirely willing. What used to be easy became complicated and I found myself quite frustrated as a result. One week, during my visit with the holy father, I even complained that I wasn’t able to commit the sins I had in mind. He looked at me with kindness and said, “I will pray that things might improve for you.” I was shocked. Did he really love me so much that he would pray for such a thing? What a strange, yet wonderful, father! I again tried to sin, but my plans were utterly confused. Nothing worked. I felt humiliated and depressed. When I visited the holy father the next week, I angrily reproached him, because either his prayers were not working or he had simply tricked me into believing he was going to pray for such a thing. With calmness, he asked, “What happened?” I complained to him freely about my woes and how I could not even sleep because of my frustration in not being able to commit the sins that gave me such pleasure. He smiled and invited me to do exactly as he did. We stood before the Holy Altar as he began to prostrate himself and rise, offering a metanoia, while repeatedly praying “Lord have mercy” for 30 minutes. I could only stand there and watch with surprise. When he was finished, he sincerely said to me, “May God forgive us both” before he prayed the Absolution over me. All at once, I arose, but it was not just waking up from sleep, it was waking up from my sin. This was the end of my sensual living. I resolved, with God’s help, never to return to this sin again, and immediately, I felt my heart to be once again pure. My genuine repentance came through the suffering of that beloved holy father who loved me so much that he offered himself for me. Prayer reaches its true purity when we comprehensively and purposefully forget ourselves, in our willingness to be concerned for others, their problems and their salvation. The degree of perfection in pure prayer is in proportion to its perfection of love. In the ultimate state of perfection love ‘seeks not her own’ (1 Cor 13:5). 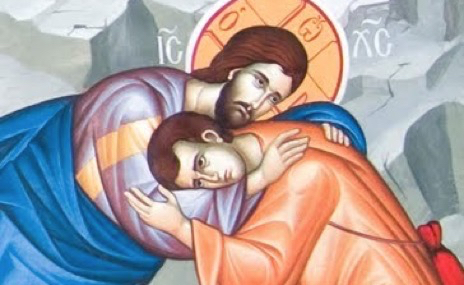 Here I am, dear Lord, sinful and sorrowful, asking for your forgiveness, through the prayers of my pious and loving father, who suffered a great deal for my sake. Have mercy upon me!